Get ready for “big, big fun” (Max Evry, Coming Soon) when the “perfect family film” (Mike Reyes, Cinemablend) "MONSTER TRUCKS" revs up on Blu-ray Combo Pack April 11 from Paramount Home Media Distribution. Get in the driver’s seat two weeks early with the Digital HD release on March 28. To protect his mischievous new friend, Tripp hides Creech under the hood of his latest creation, turning it into a real-life super-powered Monster Truck. Together, this unlikely duo with a shared taste for speed team up on a wild and unforgettable journey to reunite Creech with his family. A fun-filled adventure that never slows down, MONSTER TRUCKS features a terrific ensemble cast including Lucas Till (X-Men: Apocalypse), Jane Levy (Don’t Breathe), Thomas Lennon (“The Odd Couple”), Danny Glover (Lethal Weapon), Amy Ryan (Central Intelligence) and Rob Lowe (“Parks and Recreation”). 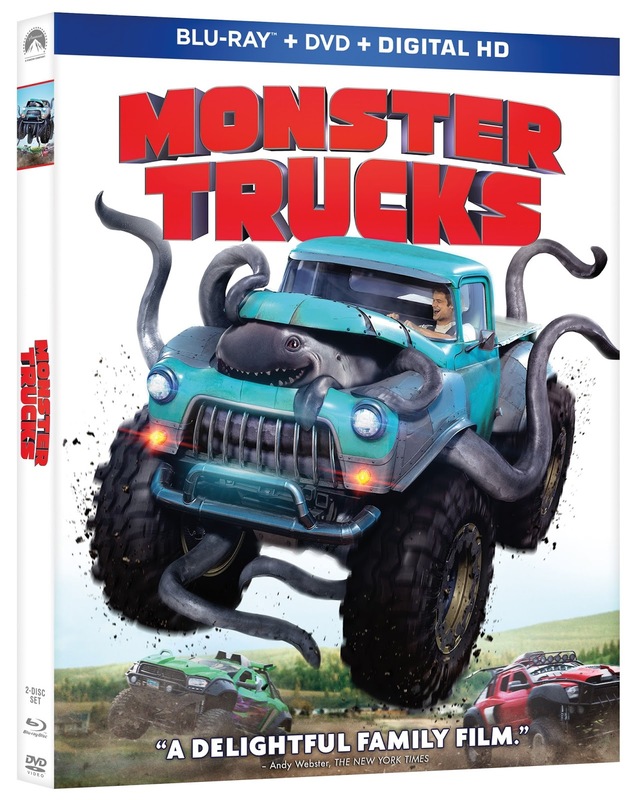 A perfect family Easter gift, the "MONSTER TRUCKS" Blu-ray Combo Pack features over 40 minutes of action-packed behind-the-scenes bonus content. Take a look under the hood and discover the magic behind "MONSTER TRUCKS" with interviews from cast and crew, deleted scenes, a hilarious gag reel and much, much more. Plus, the Blu-ray Combo Pack includes collectible "MONSTER TRUCKS" wall decals, for a limited time while supplies last.